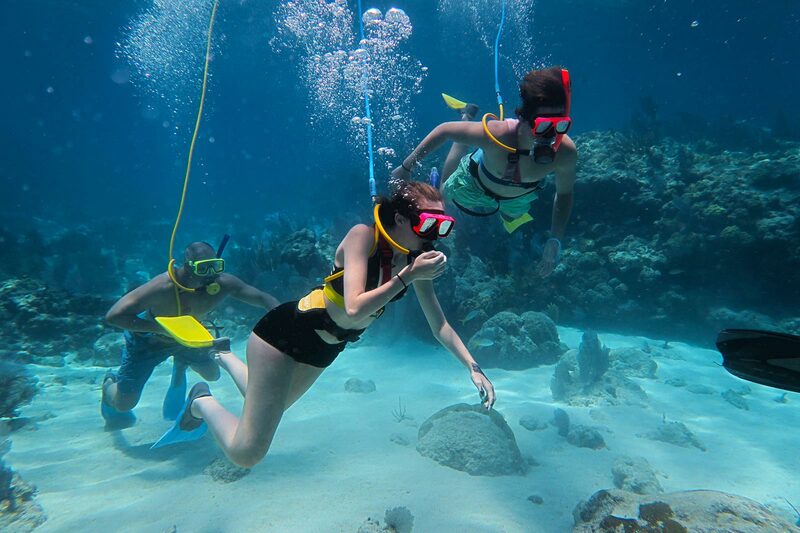 At SNUBA® Key West, our guests are provided with industry standard mask & fins for optimal vision and propulsion in the water. 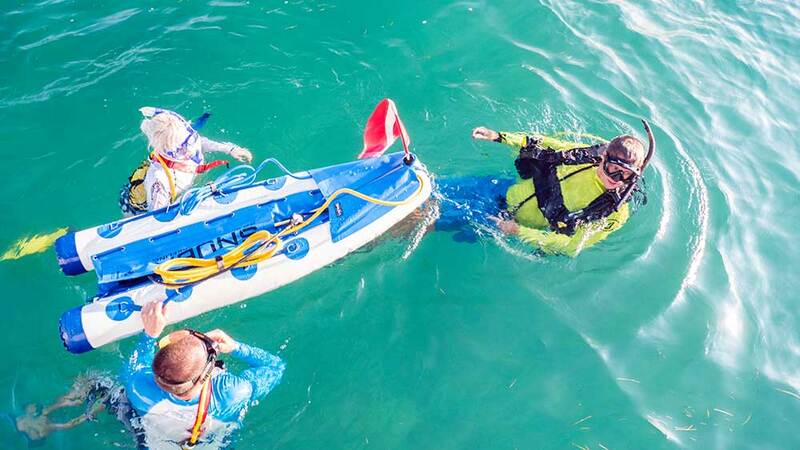 The thing that sets SNUBA® apart from other water adventures is our 20-foot long air hose that connects to a surface raft with an air tank inside! 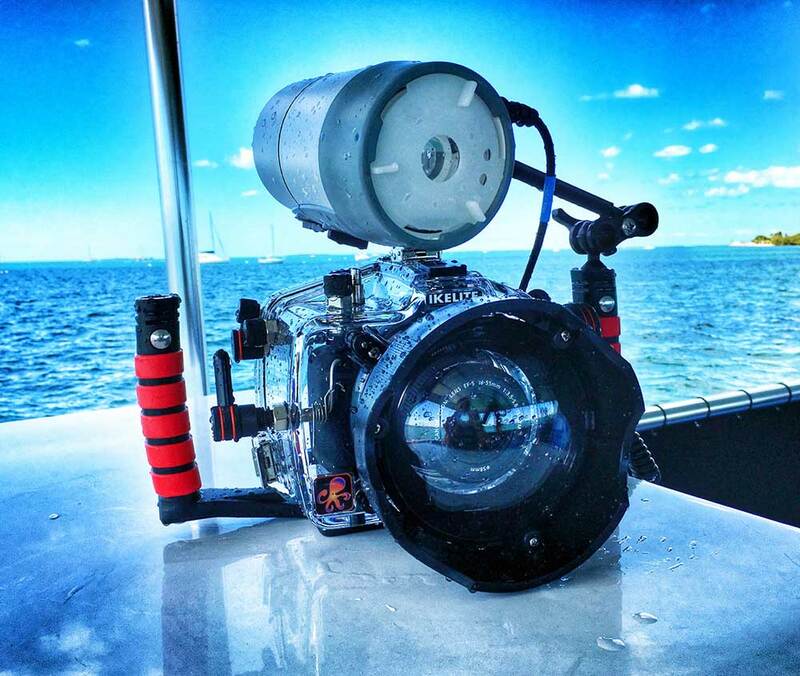 Our equipment is custom-built to allow novice divers to swim as deep as 20 feet below the surface – and stay there! 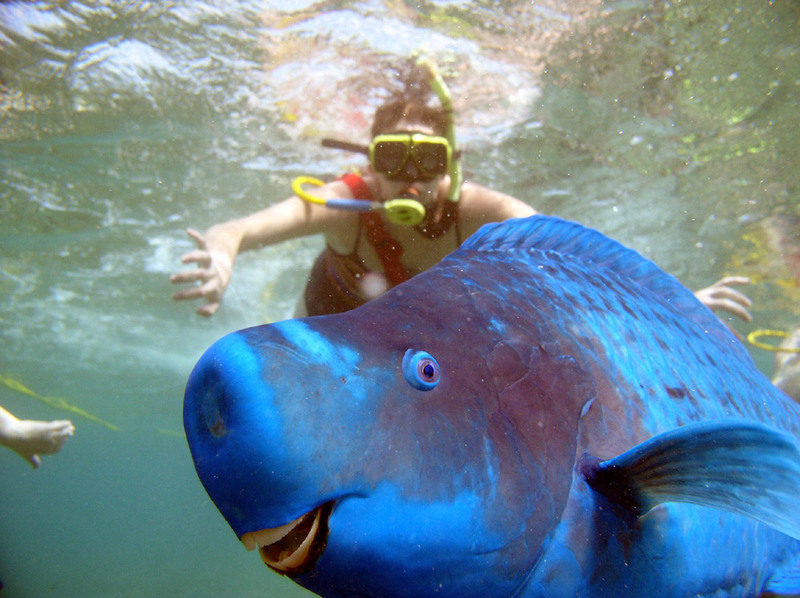 Our dive masks come in several sizes. 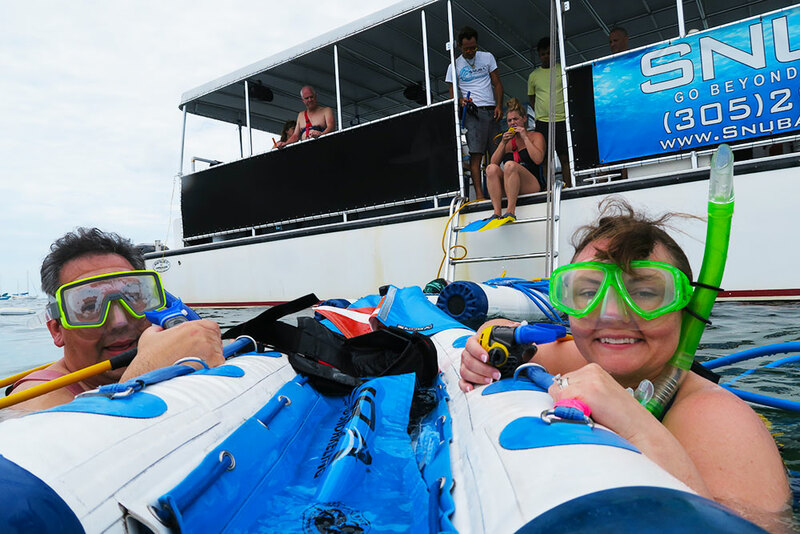 This is to be sure everyone can have a comfy fit and enjoy the dive adventure with a full field of panoramic vision! They are constructed from a heavy grade plastic frame with a glass lens and a rubber skirt that makes a tight seal around your eyes and nose. Our crew assures that each guest has a mask that fits appropriately and is positioned correctly for maximum comfort and functionality. 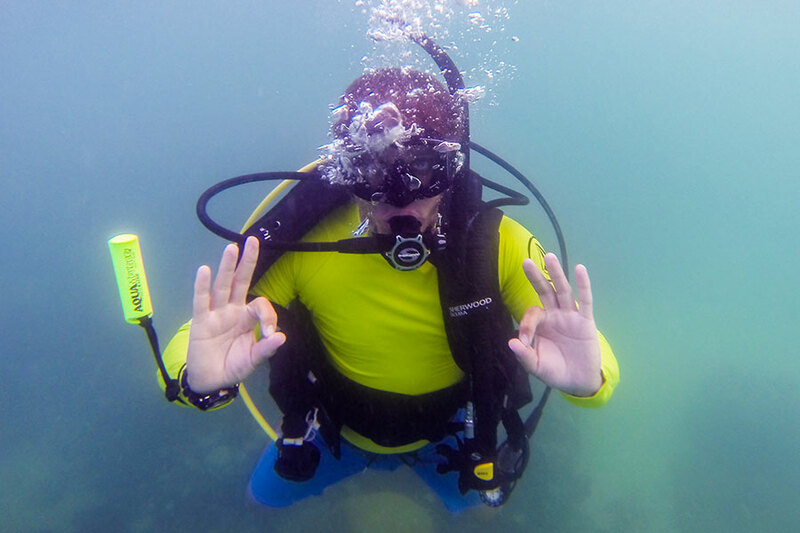 Our dive fins are what propel our divers through the water without too much effort. Since this is just a nice walk in a very wet park, we want our guests to be relaxed and able to focus on the aquatic life all around them. Without fins, it’s difficult to move very efficiently. 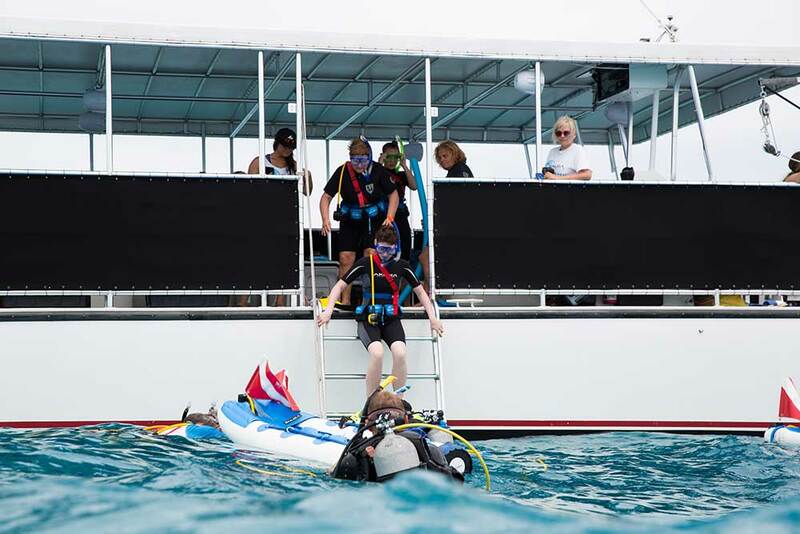 We provide fins in all sizes, and our friendly crew of Dive Professionals assists each guest with selecting the perfect pair for maximum comfort and agility in the water. 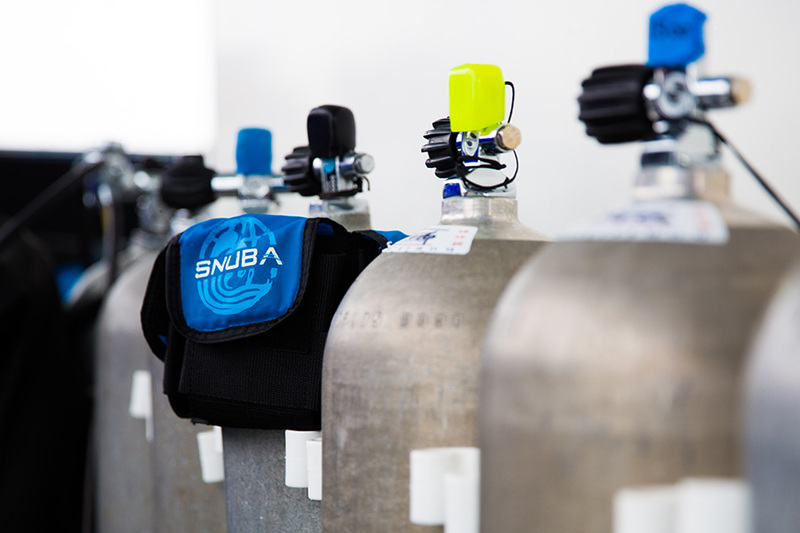 At SNUBA® Key West, we make it possible for our guests to stay at depth by providing each participant with a regulator. A regulator is a device that regulates the flow of air that comes from the air tank. The regulator is gently strapped to the upper chest and fits in your mouth the same way a snorkel does — but your regulator is attached to a 20-foot long air hose that leads to an inflatable raft that houses the air tanks. 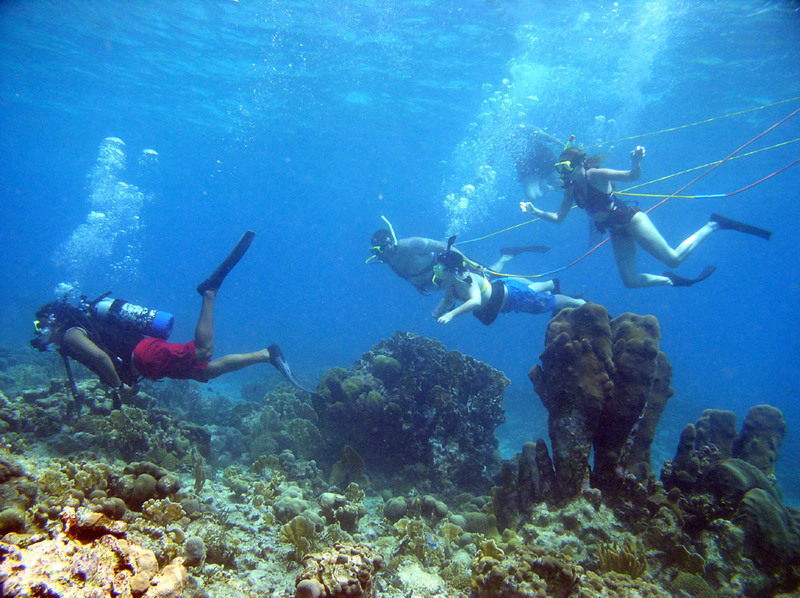 The hose is what allows our guests to stay down below the surface throughout the dive adventure. And because the regulator and air hose are harnessed to the diver, the raft follows you wherever you swim! Given the fact that we humans have some pockets of air inside of us (called sinuses and lungs) we do tend to float in the water – and even moreso in salt water. To help our divers remain at depth without having to kick really hard to stay there, we provide our divers with a weight belt. The amount of weight varies from diver to diver and is determined by our crew of Dive Professionals. 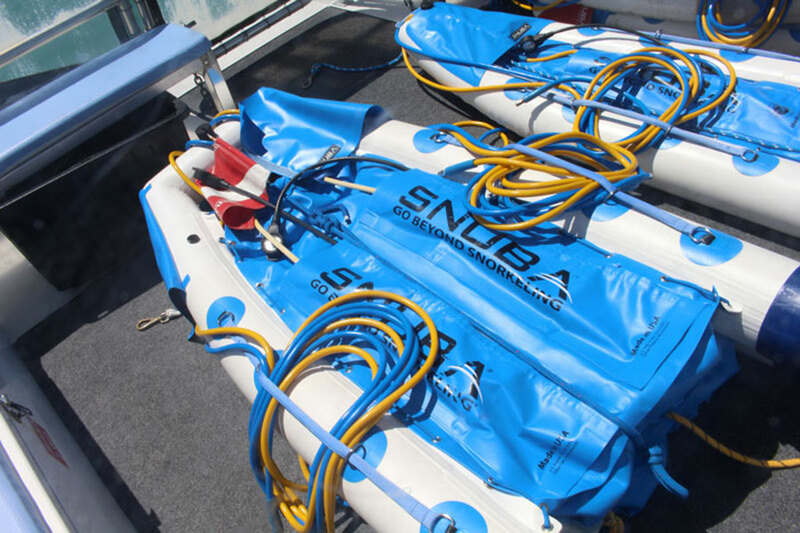 SNUBA® rafts are inflatable and come in two sizes: single tank and double tank. 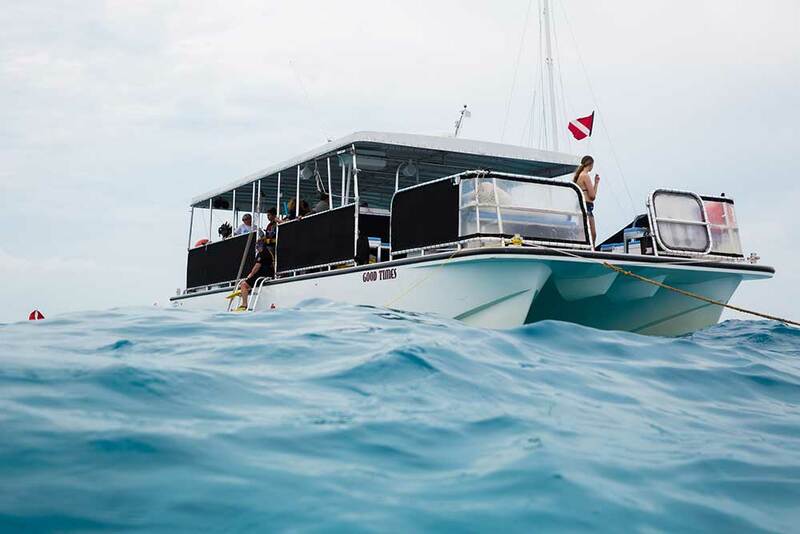 The single tank raft can accommodate one or two divers, whereas the double tank raft can accommodate up to four divers. 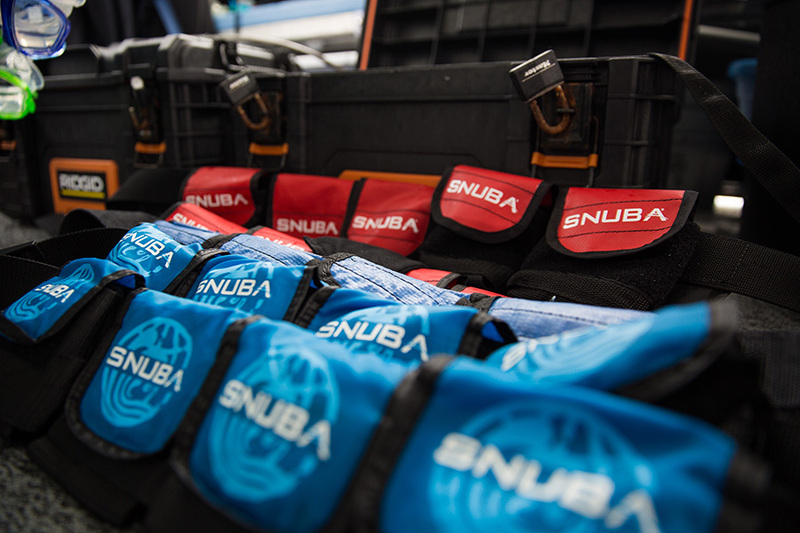 All SNUBA® rafts are constructed of the highest quality inflatable fabric capable of supporting the combined weight of all participants per raft. 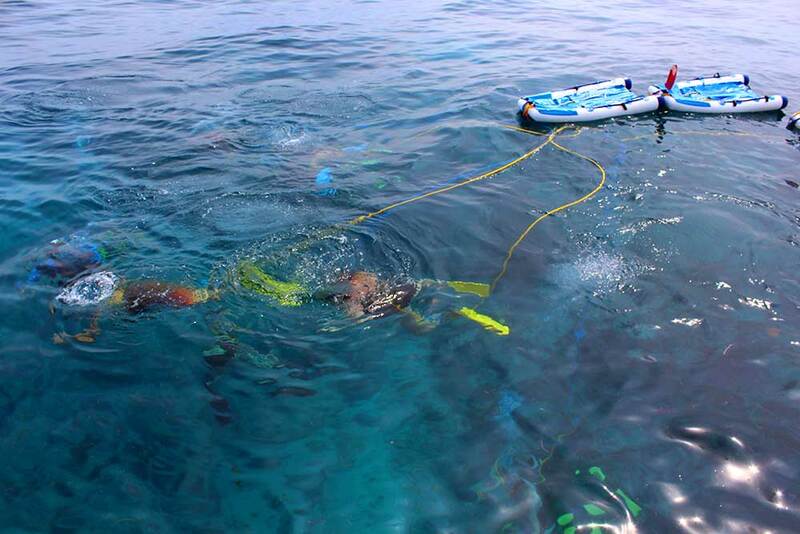 SNUBA® Key West uses industry-standard aluminum tanks with an 80 Cubic Foot volume capacity. These tanks are routinely inspected for safety and structural integrity and are filled with compressed atmospheric air to a pressure between 3,000 and 3,200 PSI. These tanks are securely strapped inside our inflatable rafts for easy diving! 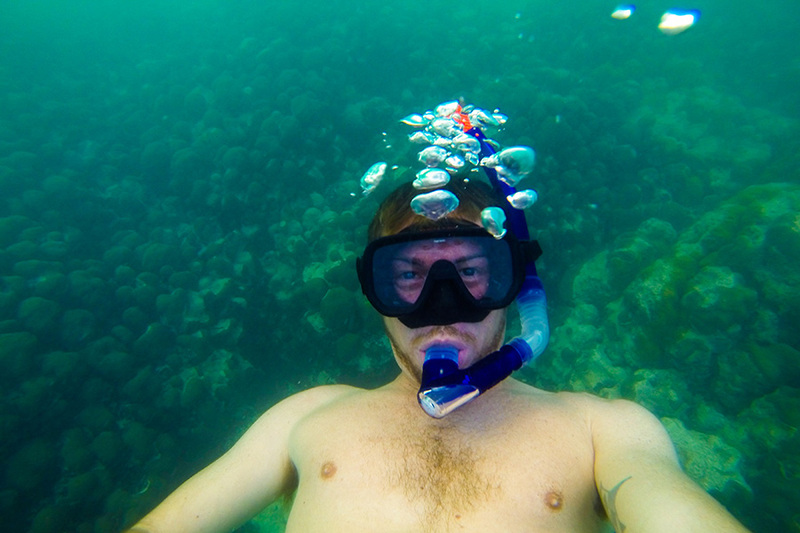 No more free-diving on a single breath! 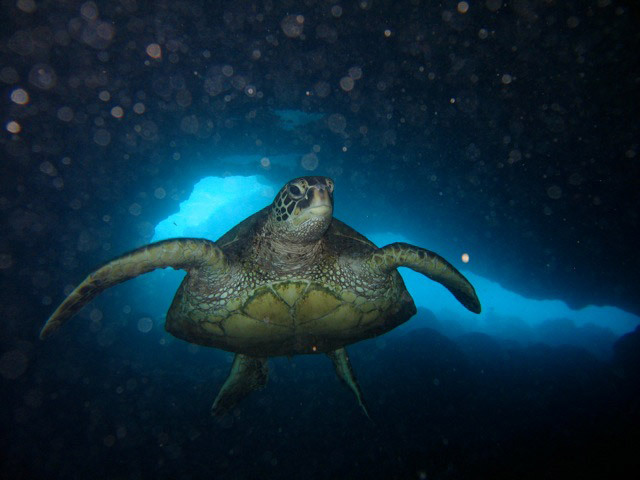 SNUBA® allows you to prolong your stay among the indigenous fish, corals, turtles, and other sea life, all without having to keep coming back up for air!